This mushroom can be deadly! It grows on dung and there is no description of it available at this time. It has a distinctively brown spore print. Always take a spore print. CAP 4-15 cm broad, nearly round or oval becoming convex and finally plain; surface viscid when moist but soon dry, smooth, white when young but in age often discoloring pinkish, buff, yellowish, or brownish, especially towards the center; sometimes with a very thin white patch of universal veil tissue; margin usually (but not always!) not striate. Flesh thick, firm when young, white; odor mild, becoming disagreeable in old age. GILLS At first adnate or adnexed, sometimes free in age, close, white. STALK 6-20 cm long, 1-3 cm thick, tapered upward or equal with an enlarged base, white, often finely powdered or scaly at apex or occasionally throughout; hollow or solid. PARTIAL VEIL Membranous, white, forming a very fragile superior or apical skirtlike ring or shredding into pieces or disappearing entirely. UNIVERSAL VEIL Membranous, white, forming a saclike volva that sheathes the base of the stalk; volva often large and ample but sometimes thin. SPORE PRINT White; spores 9-14x7-10 microns, broadly elliptical, to nearly round, smooth, amyloid. Turning bright yellow in KOH solution. HABITAT Solitary to widely scattered or in small groups on ground under oaks, hardwoods and conifers. EDIBILITY DEADLY POISONOUS!!!! One mushroom can kill you! CAP 2.5-6 cm broad when expanded, oval becoming broadly conical or bell-shaped, then eventually umbonate or plain and finally drooping; surface dry, powdery, mealy, and/or minutely scaly, usually scalier and less powdery in age; bright yellow to greenish-yellow or pale yellow, the center sometimes brown or buff; fading quickly after it matures or becoming browner; margin conspicuously striate nearly to center at maturity. Flesh very thin, yellow. GILLS Free, crowded, yellow or pale yellow. STALK 3-10 cm long, 1.5-5 mm thick, usually slender and enlarged somewhat at or toward base; dry, smooth or powdery like cap, yellow. VEIL Yellow, forming a small, superior, collar-like ring on stalk, which may disappear. SPORE PRINT White; spores 8-13x5.5-8 microns, elliptical, with an apical pore, thick walled, smooth, dextrinoid. HABITAT Solitary, tuffed, or in groups in flower pots, greenhouses, and planter boxes, or if it is warm enough, outdoors (in lawns, gardens, etc); widely distributed, fruiting indoors most anytime, outdoors mainly in the summer. EDIBILITY Poisonous to some people, according to some sources. CAP (1) 2-5 (9) cm broad, at first broadly conical or bell-shaped, soon becoming convex, then broadly umbonate to plain; surface smooth, not viscid, bright sulfur-yellow to green-yellow, or at times yellow-orange (especially when young), the center sometimes darker (orange-tan to orange-brown); margin often hung with small veil remnants. Flesh thin, yellow; taste very bitter (rarely mild). GILLS Close, typically adnate but sometimes seceding, at first sulfur-yellow, becoming greenish-yellow or olive, then finally dusted purple-brown to nearly black with spores. STALK 5-12 cm long, 3-10 (15) mm thick, equal or tapering downward, yellow to tawny, but often developing rusty or brownish stains from base upward; often curved or sinuous, dry, firm. 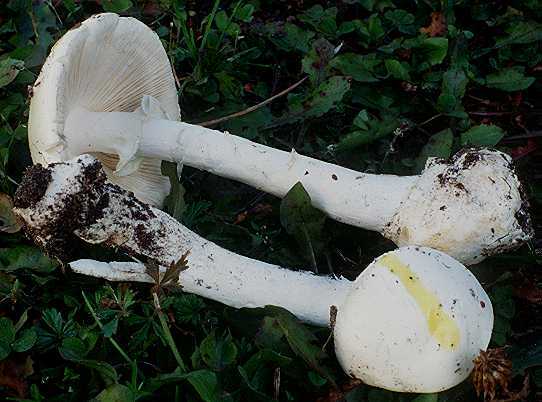 VEIL Thin, pale yellow, evanescent, or leaving slight vestiges on cap margin or an obscure fibrillose zone on stalk which is subsequently blackened by falling spores. SPORE PRINT Purple-brown to deep purple-gray; spores 6-8 x 3.5-5 microns, elliptical, smooth. Chrysocystidia present on faces on gills. HABITAT Gregarious, usually in tufts or dense clusters on decaying wood of both hardwoods and conifers, but sometimes growing from buried wood or roots in thus appearing terrestrial; widely distributed. It is abundant in California in the fall and winter, less so in the spring, and is one of the first woodland mushrooms you are liable to encounter. EDIBILITY Poisonous! In Europe and Asia, it has caused several deaths; in America, only gastrointestinal upsets have been reported. Fortunately, the bitter taste is a deterrent. CAP 2-6 (8) cm broad, broadly bell-shaped to convex becoming umbonate or nearly plain; surface viscid when moist, smooth or with a few whitish scales (veil remnants) near margin; bright green to blue-green when fresh developing yellow tones in age. Flesh soft, white or tinged blue. GILLS Typically more or less adnate (but may secede), fairly close, at first pallid but soon grayish, finally purple-brown or chocolate-brown. STALK 3-8 cm long, 3-8 (12) mm thick, more or less equal, smooth and pallid above the ring, colored like the cap (concolorous) or paler below, and usually with small cottony scales; often slightly viscid when moist. VEIL Membranous, white, soft, forming a fragile, superior ring on stalk which often disappears in age. SPORE PRINT Dark purple-brown to purple-black; spores 6-10 x 4-5 microns, elliptical, smooth. Chrysocystidia present on gills. HABITAT Solitary or in small groups in rich soil, humus, woody debris, or sometimes even in grass; widely distributed. Sometimes found under oak, aspen, and conifers. EDIBILITY Poisonous, not recommend. It is deemed poisonous by many authors but is supposedly eaten in Europe. CAP 3-10 cm broad, rounded-convex becoming plain or broadly depressed; surface viscid when moist, smooth, bright red to scarlet, the center often darker; fading in age or wet weather to pink, orange, or blotched with white; margin eventually striate (but sometimes obscurely). Flesh white (but pink under the cuticle (cap skin)), brittle, odor mild, taste very acrid. GILLS White or creamy-white, brittle, close, adnate to adnex or free. STALK 3-10 cm long, 0.7-2.5 cm thick, equal or thicker below, dry, white or whitish, usually with longitudinal lines. SPORE PRINT White; spores 7-11 x 6.5-9 microns, elliptical with amyloid warts and ridges. HABITAT Solitary, scattered, or in groups or troops in woods, widely distributed and common. Sometimes fruits late in the season in chaparral and mixed woods (oak, madrone, manzanita, and pine), often intermingled with R. cremoricolor and Lactarius vinaceorufescens. It also grows on very rotten woodunorthodox behavior for a Russula. EDIBILITY Pleasing to the eyes of all, to the tongues of some, but to the stomachs of none. As its name implies, it is poisonous, at least raw, and can be used to induce vomiting. This mushroom will make you think you are going to die and is a great trip if you dont want to get high and enjoy projectile vomiting.